I’m trying something new for wrapping up 2018. Rather than try to cram in one article near the end of the year, I’m going to put them out little by little over the next few weeks. Some of these will not surprise you, especially if you’ve been following along. Some of these may be a huge surprise because they may cover things I haven’t had the opportunity to write about. Nevertheless, in an effort to give the best of 2018 the attention that they truly deserve, each will get it’s own article and attention, rather than a bullet point in a longer article that will be lost in a few months. One of the big news items of 2018 was the engagement of Batman and Catwoman. Of course, while it was a big deal, it never ended in marriage, because nothing says DC Comics like not getting what is promised. What kind of got lost in that same week was Marvel’s attempt at the same type of event, the wedding of Colossus and Kitty Pryde. Just like at DC Comics, it featured the bride leaving the groom at the alter. Unlike the DC Comics version, this did end in a wedding, just not the one that was promised. More to the point, Marvel managed to keep it quiet, including the spin-off title from the event, Mr. and Mrs. X. The cover art was kept under wraps for good measure. 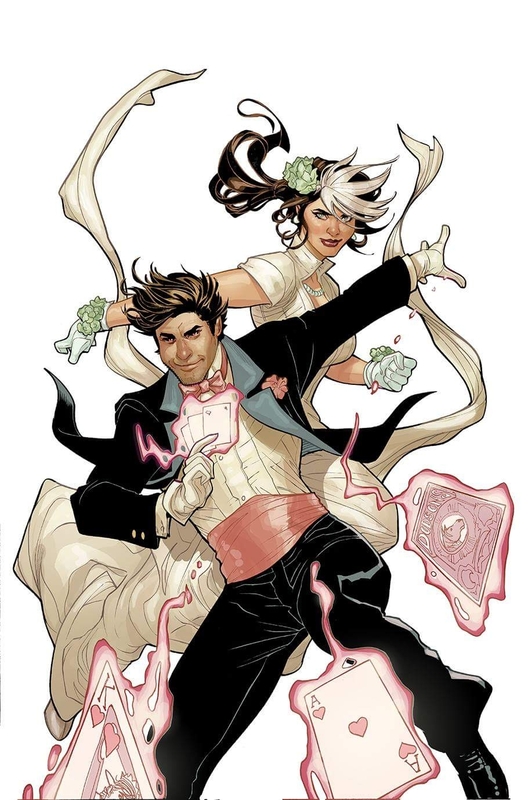 It wasn’t until the issue hit comic shops, that everyone realized that Mr. and Mrs. X were Gambit and Rogue. Gambit and Rogue are one of those couples that has never held much interest for me. Gambit always seemed a little creepy in his pursuit of Rogue. Over the years, after a plethora of writers took their stabs at the characters, I lost interest. Of course, I know that there’s a vocal fan base for this couple. As an artist, I even had to do a few sketches of them. I didn’t give this title a shot until very recently with the fifth issue. I found myself enjoying it so much that rather than review the random issue that I picked up, I decided to give the series a try and name it the series that I didn’t know that I wanted in 2018. There’s not been a print collection announced yet for the first story arc, “Love and Marriage,” but finding the individual issues shouldn’t be terribly hard, especially if you don’t mind reading them digitally. Comixology has already got it as a collection you can pre-order for February 2019. Individually, the issues will cost you $3.99, so I recommend checking out your local comic shop and see if they have the run for you. Kelly Thompson is writing a good super-hero story. There’s a lot of action and she’s very good at capturing a Deadpool that fans either from his titles or just the films will recognize. Of course, Deadpool showing up in their very second issue seems a little forced until you read it. 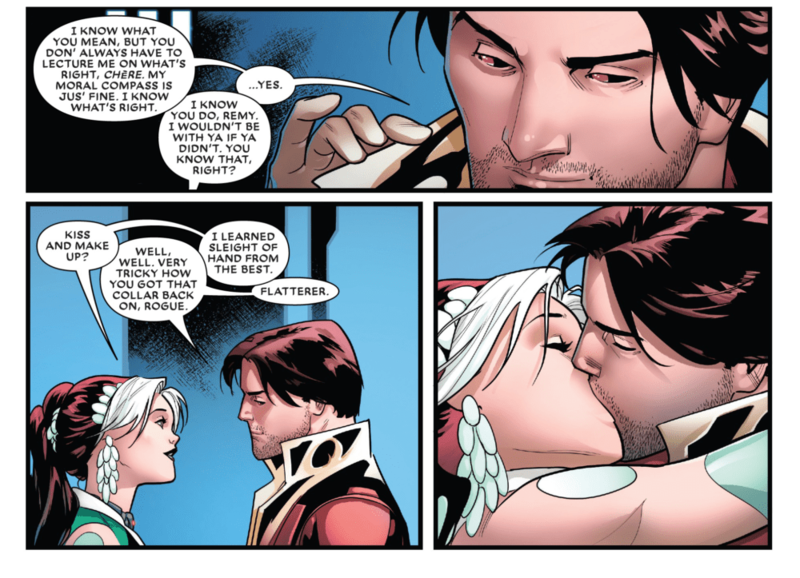 Apparently in Uncanny Avengers there was a brief thing going on between him and Rogue. Thompson writes it as something that might have been more one-sided and completely misunderstood. I don’t know that I want to understand it, but it works here, especially since Rogue wants to talk about it less the longer Deadpool sticks around. The dialogue for Rogue and Gambit seems absolutely real, given that they’re super heroes in a comic book. They are used to weird things going on, and while not unfazed by it, they do acknowledge that they have probably seen and experienced weirder. Rogue wasn’t with the X-Men more than a few months when she found herself on her first alien planet. The first friend Gambit had in the X-Men went from child to adult in the first few weeks he was with the team. Weird things happen in the X-Men, and Thompson writes this as an analogous to a new marriage. I once had four different addresses in the year that I married my wife. Things happen that once you get the chance to stop and think about it, seems completely different that now you have someone else in your life that is there and will be there. Kelly Thompson also has Gambit and Rogue talk about how their lives will be different. They have to think about each other. Gambit has always seemed like a loner, but he’s opening up his entire life to another person. Rogue may seem like a team player, but she’s one of the powerhouses for the X-Men. She’s used to going in and taken care of things on her own. I never thought of that, but Thompson makes us realize it. In the aftermath of their first adventure, it’s made clear that Rogue will have to change her modus operandi. She now has a partner, not just on a team, but in her life. She has to consider his feelings whenever she risks her life. It seems odd that Gambit would be the one to remind her of this, but it seems perfectly logical that in marriage, he’s the one that has the experience, taken on a marriage to unite the warring thieves and assassins guilds in New Orleans. His experience is that marriage is all about responsibility, and he’s addressing this marriage like that, no matter how quickly he and Rogue entered into it. I also like how Thompson addresses Rogue’s powers, making use of a dampener collar. Rogue mentions how much of a headache it gives her, but it allows her to have intimate moments with her new husband and show affection. She almost casually puts it on just to show affection to Gambit. It’s almost symbolic of how marriage can be uncomfortable at times. Sometimes, it’s completely worth it just to show your spouse how much you care for them. It’s something that I didn’t expect to get from a X-Men comic book. Oscar Bazaldua’s artwork in this series has a definite remembrance of Stuart Immonen’s influence on comics. Recently, someone mentioned that there are artists whose work shows this so much that Immonen should probably get a check. I wish I could remember who said it. Do I mind that influence showing through? No. If an artist is going to influence a generation of comics artists, then it could be far worse than Stuart Immonen. Bazaldua also adds charm to the action. A lesser artist would feel compelled to to make darker and more intense. While there’s a running gag of people being naked when Kitty Pryde makes a video call to Rogue and Gambit, he never makes it seem like it’s there for titillation. He plays it off more for comedy, and almost never in a way that seems overtly gratuitous. There is a moment where Rogue’s covering herself that makes me feel like its a little too titillating. Overall, he’s very good about not being too lecherous in his poses. Overall, I really enjoyed the mess out of this series. It’s more for Kelly Thompson’s writing than for the artwork. As I said, the artwork is good, but it’s not the reason I read five issues in two days. It’s the writing of a newlywed couple that makes them feel like a couple of newlyweds (unlike the Aventures of Cyclops and Phoenix) that will have me reading the next issue when it comes out next month.